Induces witches’ brooms and localised strong swellings of the them. The witches’ brooms are leafless in the winter; in spring they bud a month early and get abnormally short, yellowish needles. Pink, short-cylindrical aecia at the underside of the needles in a row at either side of the midrib. Aeciospores relatively densely and relatively coarsely verrucose. Abies alba, balsamea, cephalonica, concolor, lasiocarpa, nordmanniana, pinsapo, sacchalinense var. mayriana. uredinia and telia hypophyllous. Uredinia op to 0.4 mm, orange, covered by a flimsy peridium with a central pore; urediniospores with 2-3 about equatorial germination pores. 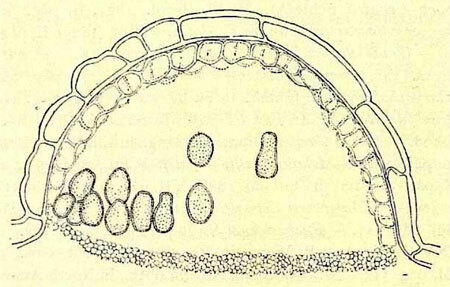 Telia often extensive, discolouring the leaf; the spores are formed intracellulary in the epidermis. Arenaria serpyllifolia; Cerastium alpinum, arcticum, arvense, cerastoides, fontanum & subsp. vulgare, glomeratum, latifolium, pumilum, semidecandrum, tomentosum; Moehringia trinervia; Myosoton aquaticum; Stellaria alsine, crassifolia, graminea, holostea, media, nemorum, palustris. In both host phases the mycelium is systemic and perennal. The plants are disfigured. Aecidium elatinum Albertni & Schweinitz, 1805. Brandenburger (1985a: 15, 97), Buhr (1964b, 1965a), Dauphin & Aniotsbehere (1997a), Doppelbaur (1973a), Ellis & Ellis (1997a), Gäumann (1959a), Henderson (2000a, 2004a), Irimia (2010a), Klenke & Scholler (2015a), Kozłowska, Mułenko & Heluta (2015a), Kruse (2014a), Maier, Begerow, Weiß & Oberwinkler (2003a), Negrean (1996a), Poelt & Zwetko (1997a), Preece & Hick (1994a), Redfern & Shirley (2011a) Roskam (2009a), Termorshuizen & Swertz (2011a), Tomasi (2003a), Vanderweyen & Fraiture (2007a), Wilson & Henderson (1966a), Woods, Stringer, Evans & Chater (2015a).